This page holds information and links about Bodypump. BodyPump classes are 60 minutes long and contain eight separate muscle-group specific songs or “tracks” along with an opening warm up track and closing cooldown track. There is also a 45 minute class format, which omits two muscle groups /tracks (biceps and triceps) and is used in timeslots where participants generally don’t have a full hour to spare. The classes are performed to music using free weights-plates, barbells and an aerobic step. Participants choose their weights based on the exercise and their personal goals. Major muscle groups are worked via series of compound and isolation-based exercises including squats, presses, dead lifts. The focus is towards muscle endurance using several repetitions. Bodypump is the original barbell class that shapes, tones and strengthens your entire body. Often referred to as ‘Pump’ by those who love it, it’s one of the world’s fastest ways to get in shape. This 60-minute addictive workout challenges all of your major muscle groups by using the best weight-room exercises such as squats, presses, lifts and curls. The key to Bodypump is The Rep Effect, a breakthrough in fitness training focusing on high repetition movements with low weight loads. This will help you achieve strength and introduce lean body muscle conditioning. With the latest chart topping music, highly trained instructors and your choice of weight, get the results you are looking for – and fast. You may believe that in order to break down fat and build muscle you need to lift heavy weights to a point of failure to generate the changes you’re after. While it’s true that muscle fatigue is necessary for changing your body from flabby to fit, The Rep Effect changes that thinking. With The Rep Effect, you exhaust your muscles by using light to moderate weights and do more repetitions instead. In a standard 60 minute Bodypump class you perform 70-100 repetitions for each body part, which equals about 800 repetitions in a single workout. If you compare this to a standard gym workout, it’s more than four times the work of what an average person can achieve on their own. With The Rep Effect you can burn more calories and achieve more meaningful fat loss and muscle fatigue to build strength without building bulk. That means a leaner, stronger physique. In Bodypump you should aim to progress the weight you lift as your body gets conditioned to the weights you’ve been lifting. Here’s a table I’m using to make sure I progress when I do Bodypump. Right now (Feb 12 after 7 weeks) I’m on stage 1 and will aim to progress every 4 weeks hopefully. Bodypump is a strength endurance training class. Not just an aerobic exercise. If done correctly, it helps increase muscle tone and definition. Most of the exercises are based around weights ranging from 1 kg to 10 kg. You choose the weight that you are comfortable with. As you progress, you can continue with increased load. You can even choose the exercise option, either using the bar or just the weight. Since Bodypump involves weight training, much the same principles apply as would for strength training. Therefore, it should only be done two to three times a week, with a day rest between each session. Do not attend the class consecutively two days. Let your muscles have time to rest for recovery. If you think you will get bored with the same music, no worry. 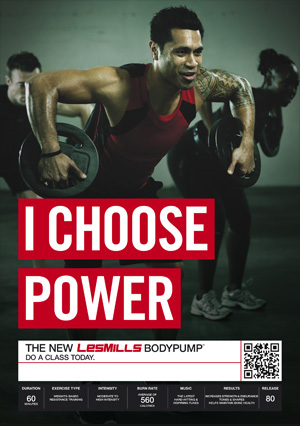 Les Mills releases new Bodypump class every three months with new music and choreography. Good posture is the foundation of all exercise, so focus on your form rather than lifting heavy weights. Guys new to it usually opt for heavy weights and fail to maintain the correct postures after few reps. So, swallow your ego and start small. Look after your joints by always keeping knees slightly bent – not locked. Always keep your joints slightly bent. Do not lock it out. Do not increase your weight too quick. For beginner, your muscles adapt more slowly, but once your body gets used to it, you will see the strength gain. Increase your weight every 4 to 6 weeks. Wear comfortable clothing which will absorb sweat. Bring a water bottle and towel. If it’s your first time to Body Pump, arrive early so that the instructor can help you set up, show you how the equipment is used, and how much weight you should use for your first class. Wk21 – Monday 24th May – back to it! !